| Contact us | New user registration | Forgot password? R. Hollenshead Auto Sales is the largest volume wholesale dealer in history. We buy and sell more vehicles wholesale than any independent entity on earth. Over the past thirty five years, our founder Robert Hollenshead honed the skill of buying cars sight unseen. After hundreds of thousands of transactions, that practice is now available to any seller! Where do we buy our cars from? Off the street. We buy from individuals and we price and buy trades from new car dealers. We currently have 948 dealers in our buying web. We are their bank. We pay on the barrel head, not on the come. That is why we have the most diverse inventory of any combinations of sellers anywhere in the country. We don't buy and reshuffle auction cars. 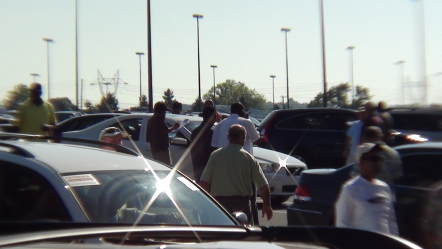 I forbid my buyers from going to auctions and buying like robots to trick a dealer into paying more for the same car. For me, that went out of style in the 1980s. In a word… DEALERS. At R. Hollenshead Auto Sales, you won’t find a retail lot decorated with balloons with customers wandering around. We’re in business to service one audience, YOU, our loyal dealers. Since 1979 our mission has been to satisfy the inventory needs of car dealers all over the world with fresh, first time to market vehicles. Whether you’re the independent wholesaler, or the operations manager of a mega chain of stores, YOU are our priority. We do all the sourcing of those hard to find units, so you don’t have to, and we leave the retailing up to you. Search our inventory and market reports right from your smartphone! New features include Vehicle Pricing Histories, mobile Watchlist, direct access to our Buyers, and Bob's Market Conditions Commentaries. Find it in the iTunes App Store or Google Play app market (search for "Hollenshead Wholesale Exchange Platform"). Why Register With Our Website? Why sort through hundreds of vehicles to find the two you are interested in? By telling us what you’re looking for, we can notify you the moment a vehicle matching your search arrives. Simply answer a few questions about make, model, mileage; save your search criteria, and you’ll be first to know when your next piece of inventory is available. It’s all about saving time!